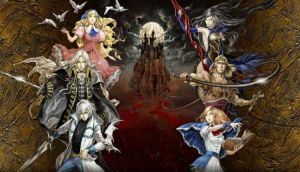 Castlevania: Grimoire of Souls Announced | Nerd Much? Konami has revealed a brand new entry into one of their most iconic and long running franchises. The publisher has announced Castlevania: Grimoire of Souls – for iOS. “A future where Count Dracula has been completely destroyed. It seemed like eternal peace came upon the world. Grimoire translates to “a book of magic spells and invocations.” So take that as you will. The game looks to be a 2.5D side-scroller which heavily incorporates multiplayer elements. Konami describes the gameplay as “Exhilarating battles where up to four players can cooperate.” You’ll moslty control the main character, Genya Arikado. He’s from a top-secret Japanese agency with a secret identity of his own. He’ll be partnered with Lucy, a skilled magician working for a research organization. There will also be guest appearances from older Castlevania games. Alucard, Simon, Charlotte, Shanoa, and Maria were the ones specifically mentioned. Castlevania: Grimoire of Souls will feature real-time co-op with other players from around the world. And it sounds like you can revive your allies that have fallen with an ability called Soul Resurrection. There will also be a four-player boss rush mode, as well as four-versus-four competitive multiplayer. The title looks great graphically. And Konami is teasing that Grimoire of Souls will utilize iconic songs from Castlevania games past as its soundtrack. The question here is why iOS though? Sure, releasing on Apple devices gains access to an audience of hundreds of millions worldwide. I get that. But a well done side-scrolling Castlevania title for Switch, PlayStation 4 and Xbox One would do amazing well I assume. The closed beta for Castlevania: Grimoire of Souls will begin around mid-May. It’s exclusive to the Japanese audience at this point, but feel free to sign up if you’re interested. No timeframe for a full release has been disclosed at this point.